Create a Team Internet Event! Tell us where your event is so others can join you! Tell us which Congressional office your protest will be at. Events will not be approved if they are submitted with residential addresses. Need help finding out who represents you in Congress? Click here. Need help finding your member of Congress’ in-district office address? Click here. Team Internet events are open to the public. Events must have a specific street address so they can be placed on the map. Event descriptions should specify support for Net Neutrality. We don’t post generic meetings or events. We promote events that are free to the public. If a contribution is required (rather than optional) for attendance, it won’t be approved. Events that appear to be fundraising focused will not be posted. Events including obscenities or offensive language won’t be approved. Team Internet is nonpartisan. If your event refers to defeating or electing candidates for office or promoting a political party, it can’t be approved. 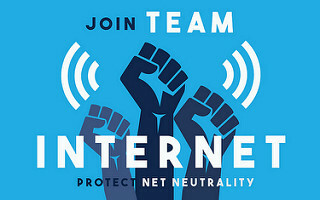 Candidates for office and political parties can post events if the focus is on organizing support for Net Neutrality as opposed to electioneering. Next, we’ll review your event for approval.